With Blue Ring, you can Mery™ the ocean or become adopted by the sea and become a child of the sea. Show your commitment to our oceans with this annual membership that funds research to develop solutions that improve the health of our oceans. Become adopted by the sea with this sophisticated sterling silver pendant. Blue Ring works to fund research that develops solutions for our changing oceans. By joining, you contribute to these solutions. "Land-based sources (such as agricultural run-off, discharge of nutrients and pesticides and untreated sewage including plastics) account for approximately 80% of marine pollution, globally." An opportunity to show your love for the sea. Join this community and show your commitment to our oceans with this annual membership in which you can Mery™ the ocean or become a child of the sea. MERIAGE: a life-long, committed relationship with the sea. 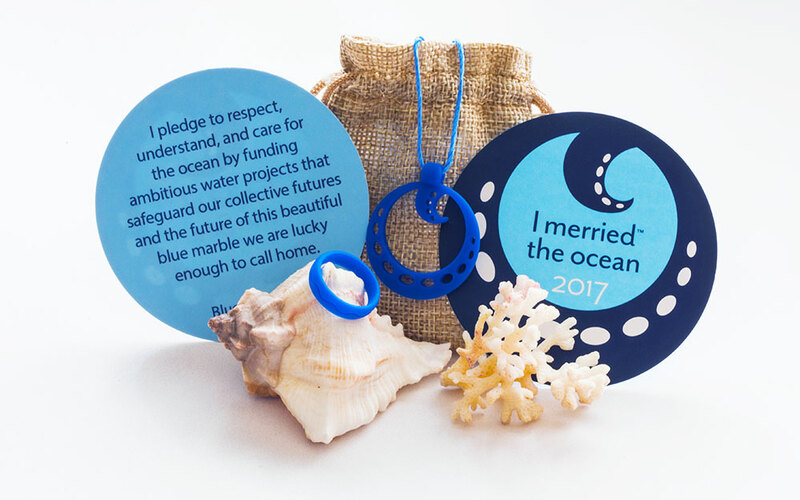 “Marry” the ocean and join Sea Change, our global celebration June 29, 2018 in Chicago. In this televised ceremony, you will be able to Mery™ the Ocean from anywhere in the world to demonstrate your ongoing and committed relationship with the ocean. World renowned oceanographer and explorer Dr. Sylvia Earle will officiate the first service. Children can become a child of the sea by becoming adopted during the service. It’s easy. All you need to do is click one of the JOIN NOW buttons on this site and register. Your digital certificate will be emailed and your ring will be mailed to the address you provide with the name you list. Instructions for how to participate in the ceremony will be mailed and emailed. You will be able to participate at the primary location from which the event will be televised, from an auxiliary location, or through the live Facebook feed. By joining Blue Ring, you contribute to the conversation and become part of a global network. Your membership first contributes to the funding of two 1,000-meter, dual-classed submersibles built by Deep Ocean Exploration and Research (DOER). These submarines will be used by Dr. Sylvia Earle to reveal oceanic discoveries. Blue Ring funds globally important ocean exploration and conservation projects through the collective power of small purchases. After the first goal is met, we will hold a competition where you can help decide which project funding supports for the betterment of our ocean planet. Joining Blue Ring is made possible through Ecwid to support international shipping and charges. Ecwid has served online eCommerce since 2009. If you’re 18 and younger, you can participate by being adopted by the ocean. Adults can join the community or renew their commitment by Merying™ the ocean. Pledge to respect, understand, and care for the ocean by funding ambitious water projects that safeguard our collective futures and the future of this beautiful blue marble we are lucky enough to call home. We are the voice of the ocean. Hear us today. Purchase a membership for someone who cares about the sea. The ocean gives us life. Without it there could be none. No ocean, no life. No blue, no green. Send questions, comments, and ideas. We also love hearing your sea stories! Subscribe to the latest on developments with Blue Ring.